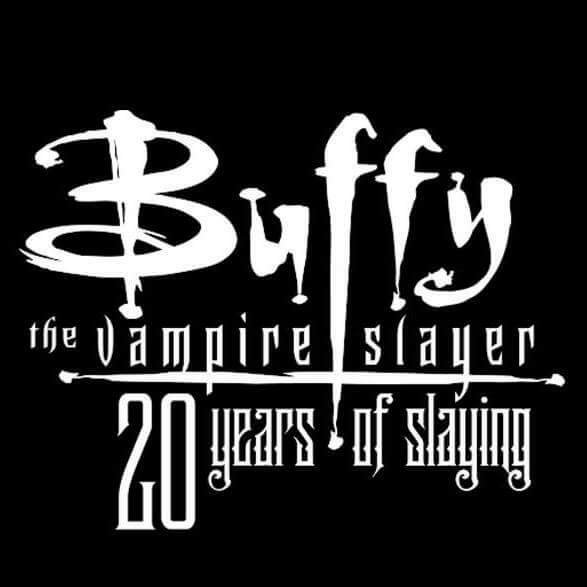 20 years ago, a tiny mid-season replacement called Buffy the Vampire Slayer premiered. I was in middle school. It was in the same weekly lineup as Charmed (hasn’t aged as well but still mostly relevant) and Dawson’s Creek (which has aged horribly). It was billed by the network as a show for the same demographic: teen girls. The show was ahead of its time; it was immediately classic and still has a ginormous cult following. It ended with 7 filmed seasons but continues its cannon with graphic novel of 3 “seasons” with another on the way. The show is one that was not only ahead of its time, but was ahead of my time. When it was on the air originally, I loved it and I was glued to the idiot box every week then had long discussions with my middle school friends dissecting what we had just seen. What folks were wearing, who was super cute, how unbelievably hot Spike is. When my sister passed away in 2005, I watched The Body (aired in 2001) over and over again with gut wrenching sobs and just allowed myself to feel the hopeless sad and emptiness that followed. 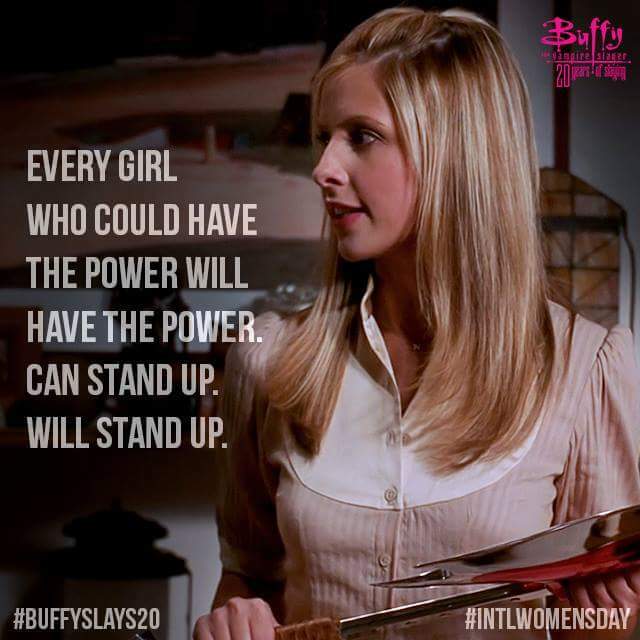 As I dealt with the emotional fallout of her death in the following months, I watched Once More With Feeling (aired in 2001), as Buffy just needed to feel. Life was not turning out the way it was supposed to, and I felt hollow, empty, nothing. More than a decade later, as I was reeling with postpartum issues, I turned to The Gift (aired in 2001). The hardest part to do in this world is to live in it. Be brave. Live. I use many tracks from Buffy episodes, but mostly Sacrifice, for meditation and yoga purposes. I’ll never forget the first time I was told Buffy wasn’t for me. I was a freshman in college and I had all of my seasons on DVD with me, and watched them regularly and religiously. Talked with folks who I thought were friends at the time, about our shared love of the show. Was told by them that I’m not what Buffy represents at it’s core. It was my for others: for needs and rejects and social outcasts. It was for folks on the fringe and I’m too mainstream. 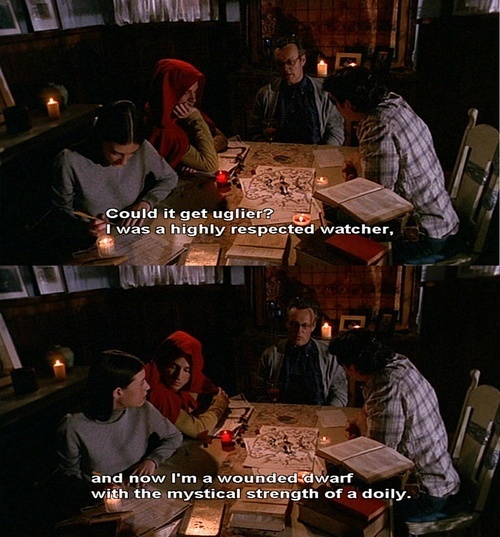 I’m exactly who Buffy was made for. I’m the key core demographic. I’m human. Therefore Buffy was made for me. And you. And anyone who has emotions and lives life. But don’t take my word for it. Anthony Head (Giles) can tell you all about it. This entry was posted in Pagan Life and tagged BtVS, Buffy, buffy 20 years, Buffy the Vampire Slayer, heathen, Magick, pagan, Wiccan, witch. Loved your thoughts on Buffy. You hit the nail on the head with “I’m human. Therefore Buffy was made for me”. It is one of those shows that stays with you.